To love or to hate: Sandpoint’s new public art is gaining attention, good and bad. You can’t please everybody. It’s a lesson Sandpoint, Idaho, city officials are learning as they take criticism over a recently dedicated public art installation in the city’s downtown. “The money could have gone toward Kinderhaven or Angels Over Sandpoint,” she says, referring to a pair of local social-service nonprofits. The piece riling this Northern Idaho community isn’t some Buddhist elephant god or a feces-covered Madonna but, instead, a collection of fish crafted from recycled road signs. The fish form a rainbow of blues, oranges, yellows and whites that flop their way across the arch. Some read “ski area,” “anti-icing” and “airport” — a reminder of their former lives as instructional signage. 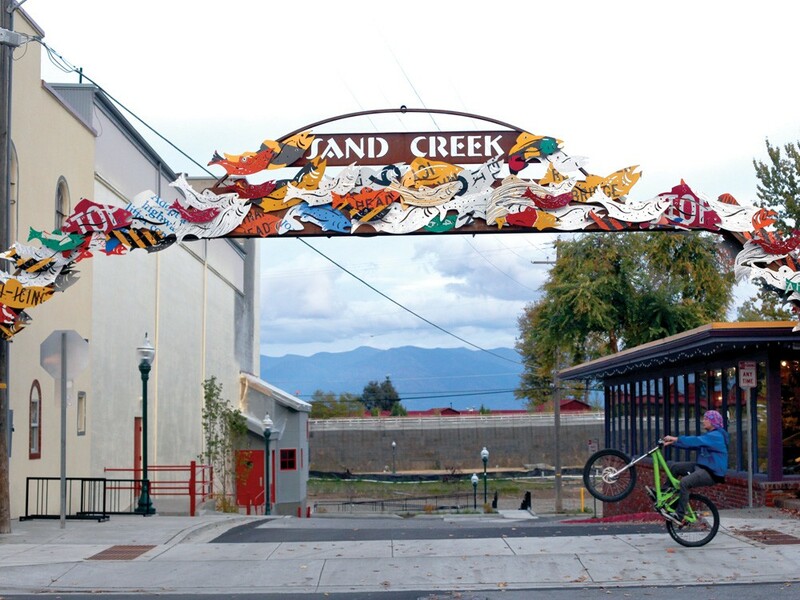 Known as “Sand Creek Arch,” the piece was created by Sandpoint artist Nelson Boren. It now stands on First Avenue near the Panida Theater. The piece was financed by a $37,000 grant from the Idaho Transportation Department, according to city project coordinator Stephen Drinkard. The idea of the arch is to frame Sand Creek, which lies a short distance away. But some Sandpoint residents see it as an eyesore. Online comments in response to a Bonner County Daily Bee story also criticized the piece. The controversial arch also comes as Sandpoint seeks to add more public art to its already well-known cache of resident artists and galleries. The city last week accepted proposals for a series of public installations to be installed nearby, on Second Avenue. Those pieces will be financed by $18,000 from the local urban renewal agency and could be installed as early as winter, according to Drinkard. There is also a plan to install a smaller arch and more boardwalk space down by Sand Creek, not far from Boren’s arch, according to Drinkard. Drinkard, who speaks enthusiastically of plans to ratchet up Sandpoint’s reputation as an artists’ haven, says complaints about the public art piece are overblown. Boren, the artist, did not return an email last week seeking comment. Carol Deaner, chairwoman of the Sandpoint Arts Commission, said Boren is living in China through next spring. But Deaner says that the point of public art is to provoke discussion. “I’d like to see some people looking at them, talking about them, discussing them,” she says. Deaner adds that she has heard comments similar to the one written on the Daily Bee’s website. Several Sandpoint residents and visitors told The Inlander that they like Boren’s creation. “I love public art; it spruces everything up,” says Trevor Lazenby, a Canadian who vacations every year for a week in the Sandpoint area. “I’d rather look at this than the alternative,” the 40-year-old says as he sits on a bench next to the arch. Resident Pat Packowski likes the art because its helps cement her city’s reputation. “I like it, because I think of Sandpoint as an artsy town and I really think they’re trying to develop it,” Packowski, 65, says. Boren’s arch may eventually just become another piece of the varied downtown landscape in Sandpoint: something noticed but not remarked on, discussed or unpacked.